This single malt scotch whisky was bottled in 1998 to commemorate the 200th anniversary of the distillery and as a way of celebrating the contribution made by all its employees both past and present. Full bodied and wonderfully balanced this is a mixture of hot cross buns and candied peel – a bit like a special occasion. There’s not a lot left, so its not cheap – but in our opinion it is a must have experience! 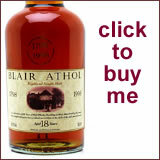 What Do You Think of 'Blair Athol Bicentenary Single Malt'? Rate It Below!